As the Winter is in its fag end at my native, one of my school friend called me few days back to check if I have Pakore Wali Kadhi in my blog. 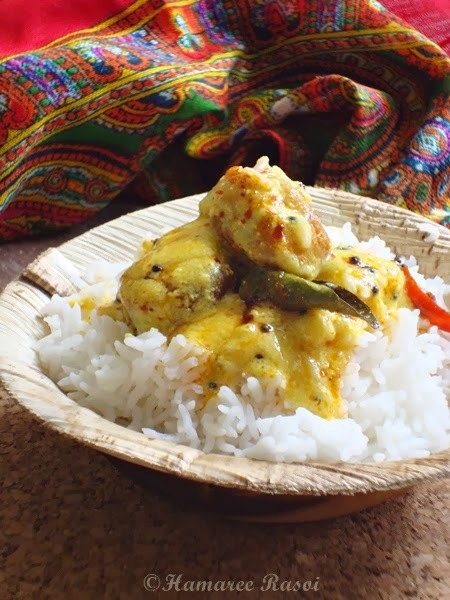 So nice to hear that my classmates read my blog :-), I am posting this unique North Indian recipe called Kadhi or Pakore Wali Kadhi. Having lived in the foothills of Himalayas, Haridwar to be precise, this is the closest meal one could have during chilly winter period to keep oneself warm. I remember, my mom used to do all the hard work on a foggy morning so that we can come for lunch at home and eat hot fresh food. Next to our dinning table was heat blower which used to run for hours before we come for our lunch break to give us some respite from chilly winds outside. Hot and spicy yogurt soup with soft fritters are perfect for cold winters. 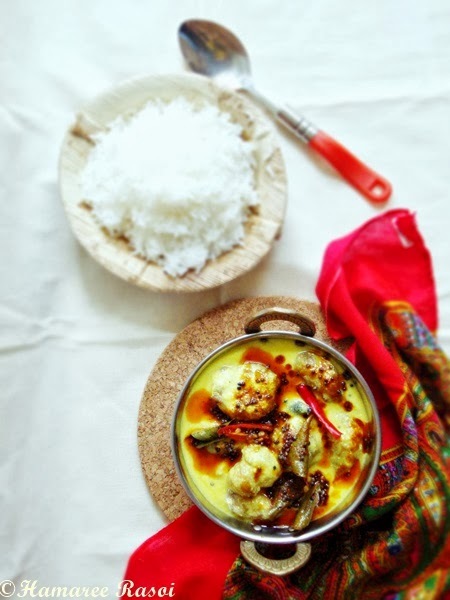 This kadhi goes well with rice and my vegetarian friends who crave for a tasty and warm meal during this season will love it. Since it takes 30-35 minutes for the kadhi, so in order to save time do prepare the pakoras while the gravy is been cooked. For gravy:In a big bowl add curd, water, besan, salt and haldi, now mix well with the help of a blender blender keep aside.It should look like buttermilk with no signs of besan lumps. Keep aside for 20 minutes. Heat mustard oil in a big kadhai till the flames appear, now put tej patta, whole red chilly, raai, methi seeds, curry leaves. Stir fry for few seconds, add red chilly powder and then the curd water mixture. Let it boil on high flame (keep stirring frequently). Now cover with a lid and let it cook on simmer for 30 minutes. Before seasoning make sure that the kadhi is hot. Garlic is purely optional, in fact you can add chopped onions too for tadka. Soaking pakoras in warm water is done to soften it, try it once and you will feel the difference. This looks wonderful, that reminds me that I should make an attempt at it, I always wanted to try it! I am coming.. keep some kadhi chaval for me. Love the shawl and the kadhi ,Deepa.Send me both please ..desperately looking for some warmth. Kadhi looks really yummy and delicious! Wonderful Deepa, the pakore wali kadi looks perfect. Lovely presentation and delicious looking kadhi! we make it the other way. Pakoda kuzhambu. Yours looks so creamy. 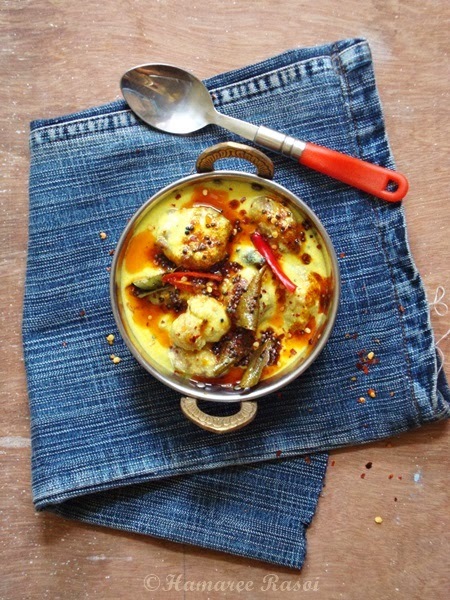 Pakoda Kadhi looks very nice and I am sure its an awesome side to have in the cold cold winter months! Kadhi looking so delicious and tempting! Lovely kadhi chawal and lovely clicks. First time on your blog...lovely collection.